A scarf that can be worn all year round! This intricate lace look shrug is hand crocheted in an infinity style to be worn as a shrug on chilly evenings. It can also be worn as an infinity scarf down loose or doubled up. It is very lightweight so it can be worn on hot summer days for weddings, cocktail parties or walking along the beach on a cool night. Or it can be layered over a sweater in the winter for a trendy look. Can be dressy or casual. 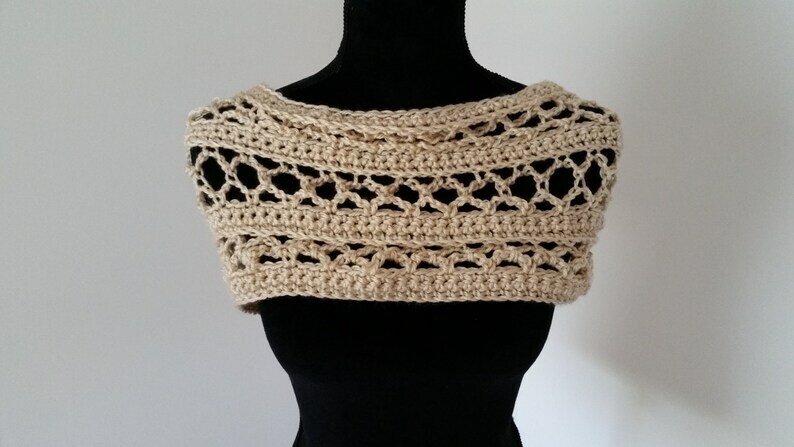 I used an ultra soft acrylic yarn in a very light shade of beige. This scarf can be machine washed gentle cycle and tumbled dry on low. It measures 60 inches in circumference and 7 inches in width.